The first 2019 Faculty of Engineering graduation ceremony took place at the University’s iconic Seme Hall saw a full house of parents and guardians from all over the Republic as they bear witness to the highlights of their children’s academic journey. The parents, whom the University respects and revere for the support of their children and their trust in the fact that MUT can change their lives for the better, came to witness a life-changing event for their children. For as long as necessary, the parents sat quietly, listening to the Acting Vice-Chancellor, Prof Marcus Ramogale, the Honoree of the two Faculty of Engineering ceremonies, Nondwe Monyake, as they addressed the audience. This silence was not going to last for long. 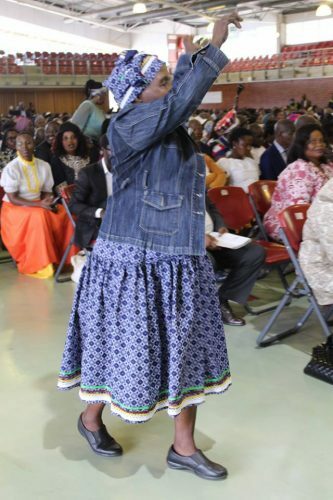 As students received their qualifications, parents broke out in songs and ululation, accompanied by whistles, as the names of their children were called out to come to the stage and be capped. The different cultural and religious dances that were performed on stage were a strong indication of how African MUT graduation ceremonies are. Thembinkosi Majozi who graduated with a Diploma in Mechanical Engineering even called out a war cry, Hebe! Usuthu!! MUT changed their lives, and it cannot be denied that their lives have changed for the better. As was announced by Prof Ramogale, MUT graduates are playing a big role in the economic sector, as employees, and job creators. The recently graduated students will eventually land jobs. They will also do well to take Prof Ramogale’s advice to look for work, not jobs. Meaning, they should think long and hard about creating their job opportunities, by creating their own businesses, as has been done by former students like Zenzele Dlomo, a goat breeder in eMakhabeleni, in Kranskop, central KwaZulu-Natal. Zenzele benefited from the knowledge he gained when he was studying towards a Diploma in Accounting – Public Finance more than 10 years ago. Other former MUT students that the graduates would do well to emulate are Thandeka Ellenson, the Acting CEO of the Moses Kotane Institute, and Thabang Mofokeng, the founder of the SAMAC Engineering Solution, to name a few. The ceremony was also attended by the KwaZulu-Natal Deputy Surveyor-General, Thamsanqa Phakathi. Phakathi is a product of MUT. “My office is indebted to Professor Koos Landman for this gem,” said Monyake. The ceremony was dedicated to Monyake, the Surveyor-General of KwaZulu-Natal Province with more than 20 years’ experience. Monyake holds a B.Sc (Surveying) from the University of Cape Town. She is one of 41 black surveyors registered with the South African Geomatics Council. Her message to the graduates was simple – the value of integrity. “You need to have strong moral values. Integrity is forever,” said Monyake. She appealed to graduates not to disappoint their parents by lacking in integrity. “Go out there and be Wendy Okolo who has become the first black woman to get a doctorate degree in aerospace engineering at the tender age of 26 and now works for the American Space Administration (NASA). Show South Africa what you are made of,” she said. The ceremony was closed by what has now become a signature tune for all the University graduation ceremonies – the Last Dance, which is a symbol of the ceremony as a rite of passage.